Due to brisk sales, Pete, Niki, and Carl have added a third Starting Strength Training Camp on July 14. The July 6 and 7 dates are already mostly full, so don't delay. Mark Rippetoe teaches you the upright row – an exercise guaranteed to supercharge your training program no matter your goals. 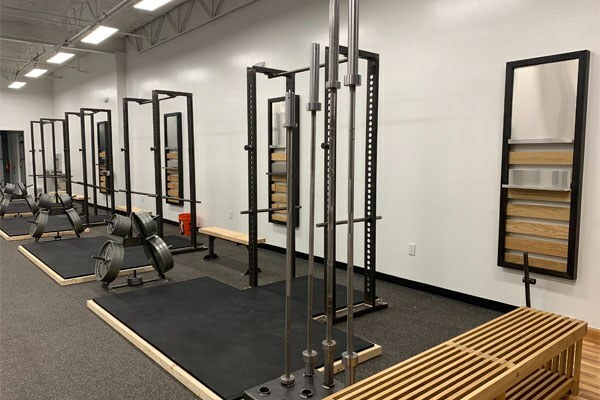 A Quick Tour: Grant Broggi stopped by White's Boots, manufacturer of the Starting Strength Weightlifting Boot, on a recent trip to Spokane, WA. The weightlifting boot will be available Summer/Fall of 2019. 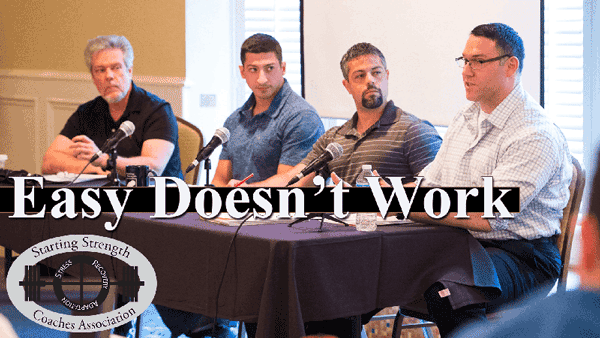 Jim Steel describes how times have changed in Strength & Conditioning as access to information flooded gyms and programs with a mixture of good and bad information. From the Archives: Nick Klemetson discusses adapting Starting Strength for the obese trainee so that gaining strength and muscle can benefit this population. 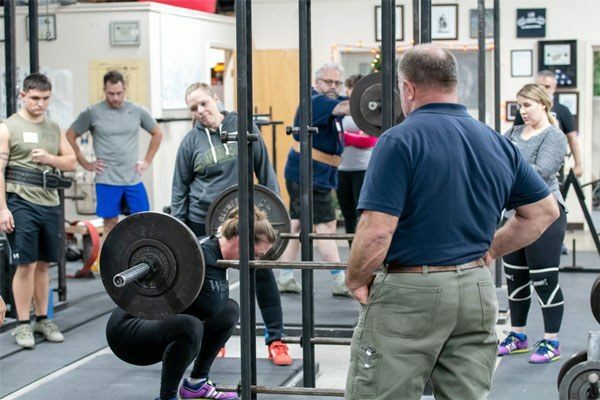 Emily Socolinsky draws your attention to the Santa Claus-in-the-chimney illustration in Starting Strength as part of how she teaches lifters how to stay tight in the bench press by correctly using their upper back. From the Archives: Mark Rippetoe and Chase Lindley demonstrate how to do the fourth powerlift – the lying triceps extension. Horn Strength & Conditioning has specialized in teaching beginners how to lift weights correctly and safely. 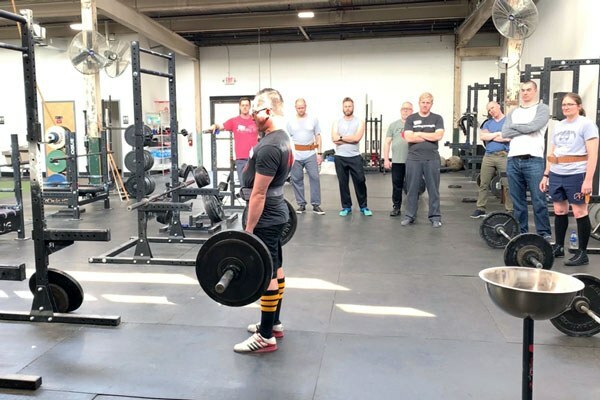 Since 2011, Paul Horn and his coaches have fulfilled their mission to "help people of all ages and athletic capabilities build stronger, more useful bodies through a simple, straightforward, systematic approach to barbell training." If you're in Los Angeles, or just passing through, this is the place to train. 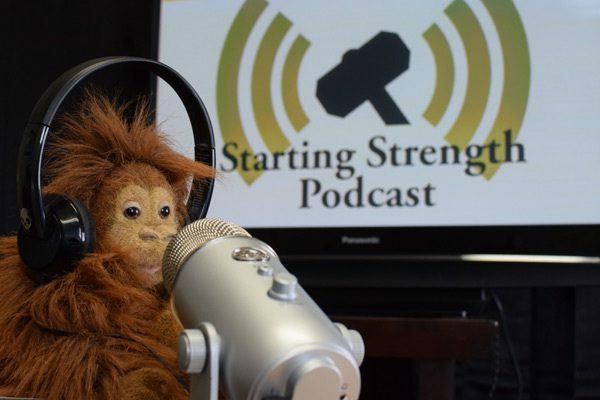 Rip joins the Strength & Scotch podcast with Grant and Heavey discussing how things evolved with SS, training, and several other things. When I began training 18 months ago using the SS method there was literally no one in my gym who knew what a low bar squat was and I found myself constantly accosted by leagues of good Samaritans telling me I would break my back if I didn't get more upright. I politely refused their advice and after a year they finally gave up trying. Yesterday was revelatory. I watched a guy on the next stand perform a beautiful LBS. I noted he also wore proper squat shoes on. After a few minutes chat he confirmed he was following the SS method. So it looks as if the tide is turning. Apparently there are also a couple of guys walking around my home town in Starting Strength tee shirts, so it appears narrowcasting is finally paying off in the far flung reaches of Northern Europe. Amazing. Momentum? Anybody else have a sighting? No sightings, I had someone look at my do-wins while I was squatting and told me I was going to hurt myself and throw off my center of gravity and needed to buy some chucks. He then went to the leg press machine and even managed to half rep those. I'm the guy who wears Starting Strength shirts at my gym. I coach newbies a lot, even friends who ask me to supervise them or teach them how to clean if they're already gymgoers. Everyone I see who squats and then presses and deadlifts usually says they got it from YouTube or Stronglifts or whatever. Never once heard someone tell me they got it from Starting Strength. So I just recommend it to everyone and they always have to save the name in their phone. Don't think many have looked you up, but then I don't see many of them a second time around. One time a guy was squatting 220 in Adipowers, same as mine. He had probably the worst form of anyone in lifting shoes I have ever seen. His elbows were pointed way up, as was his head but he kept looking forwards into the mirror, as he slowly pushed his hips back as far as they could go, not even close to hitting depth. So one time I walk over to him and go "nice shoes" to break the ice, but he didn't get it. I explained my dumb dad joke to him and he kind of laughed. I then, quite aggressively in hindsight, asked him if he wanted me to teach him how to squat. Somehow I imagined he would be at least curious to hear what I had to say, given that his form was beyond repair. Instead, he laughed and, without any physical gestures since I'm much taller and bigger than he is, he waved me off saying something like "I've been doing this for quite a while." I begged to differ and told him he wasn't hitting depth at all, to which he responded he "worked 14 hours at a desk job and so his hamstrings were tight." He then rambled on about how tight his hamstrings were before coming to a dead stop and I just said alright and left. Haven't seen the guy since, but I doubt he's making progress. He was stuck on 220 for 6 months. But so far no SS sightings in the wild. I'm the only guy I know who reads and refers to your material. And everyone else in my group just comes to me. I also live in Northern Europe. I see low bar squats at my (chain) gym routinely; I've also spotted a couple of guys doing the SS program. There are even a couple of geniuses that bench in the rack with safeties. Giving unsolicited gym advice is kinda like unsolicited political or religious advice. No matter how good intentions are most folks don’t want to hear it. The Starting Strength app is #110 (of 100k+ apps) in the Health and Fitness category in the AppStore. 4.8 stars with ~1000 ratings. Really damn impressive. I have seen quite a few younger guys working the program, novice LP to more intermediate stuff at my YMCA. Most of the kids have the book, some of them I have bought a copy for. If they are serious about their training in my judgement, and are interested in learning the movements, I have no problem buying SS 3rd Ed. for the college kids. One high schooler I saw outside of the gym while I was walking the dog. He was walking back from the store and proudly showed me what he had in the bag: a cold half gallon of whole milk. That made an old man smile. I've just started the transition from novice to intermediate (315 squat, 395 deadlift). I'm a competitive person, and feel like the best way to motivate myself to continue to drive my lifts up quickly is to find a competitive outlet. The most obvious carryover from SS is powerlifting, but I've read a lot of rather dubious things on The Internet. A lot of people say things like, "I don't care about where I place, I just do contests for myself", "I only enter contests to set contest PRs/break federation records", "Nobody cares about who wins, and nobody cares about anyone else's lifts" etc. etc. If this is really the case, I'd prefer another sport where winning really matters, if only to the contestants. Is this really the mentality of most powerlifters these days? You mention a few times in your books that you worked hard to win powerlifting contests - is the current mentality different from how it was 20 years ago? Or is this just a case of a minority viewpoint being over-represented by YouTube and Instagram, and actually most powerlifters really are concerned with winning? A lot of people say that the earth is 6000 years old. A lot of people say that The Reptilians enslaved the Bilderbergers in the 18th century and have been managing the global economy since then. A lot of people say that the secret moon base has been having HVAC problems for the past few months. If I were you, I'd just go ahead and enter a meet and win it, since nobody there will be trying to beat you. At a high enough level winning definitely matters. There was a great battle this year at USAPL Raw Nationals in the 83kg weight class for first place between Sean Noriega and Russell Orhii. If you care about winning, then winning matters. I think the main issue here is the combination of: a) powerlifting meets are logistically difficult enough such that they're not widely available in any given gym on any given weekend, and b) it's a low numbers sport in terms of participants, the result being that, unlike other sports you're probably thinking of, national and international level lifters, or certainly aspiring ones, lift at the same meet as first timers. So no, they're not competing against each other. 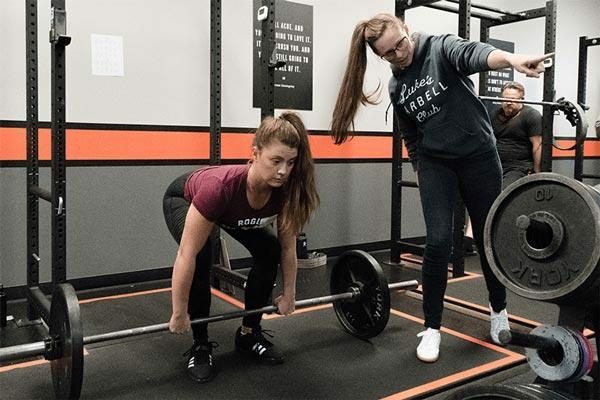 The good lifter is either doing it as a training meet or a qualifier, and the first timer is trying to set a PR and participate in something fun and fulfilling, or maybe nerve wracking and therefore fulfilling. Whereas with, say basketball or bowling or softball, you can play in rec leagues or beer leagues with your buddies, and watch LeBron and Steph Curry on TV - you don't play in the same games, unlike powerlifting. 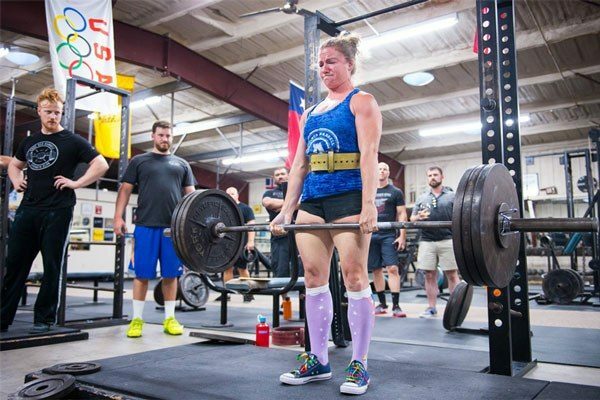 The sport has seen a massive increase in participation over the last 5-10 years, so you don't have as much top level lifter intersecting with average Joes and Janes as you did even 5 years ago, but the numbers are still relatively very small and the difficult logistics of putting on a meet still stand. So you don't have rec leagues having games every weeknight and weekend like you do for basketball or hockey or whatever. I'm sure if there were millions of national participants, it'd be different, but there aren't. That does seem to be an argument in favor of you doing meets anyway. The more participants there are, the more meets there will be, as the last five years have shown us. But the sport needs plain old participants who do meets, who watch their friends and family at meets, and who care about meets, to support the lifters at the top who are not merely participating but competing. And as Alex above me just noted, lifters who compete certainly do care about winning. On the other hand, the meets are great for people who like or need goals. Lifting to a standard (some are much better than others) and getting a total is a great way to measure your progress and keep you motivated. This is why I'm excited for the USSF to add a junior category. Not too many youngins. It really depends on the meet. Local ones are less competitive, and as others said you may have really good lifters there competing with average joe's looking to qualify for nationals. But as you move up to the better events, many times there is a minimum qualifying total by weight class, and you typically have to win a local meet before that. That still doesn't totally close the gap, since people competing with minimum qualifying totals will probably not win nationals. There are also invite only meets where a promoter will get some of the best lifters in the world together to go head to head.